Thanksgiving pies at the North Pole! Yummy! Yummy North Pole Thanksgiving pies! Are you counting down to Christmas? I am. Before Christmas is another special holiday, Thanksgiving. Not every country around the world celebrates Thanksgiving, but we do at the North Pole. Thanksgiving is about being thankful. It is about spending time with the people (and elves and reindeer and snowmen and pets and… ) you love. It is also about feasting on delicious food! Like yummy Thanksgiving pies! The elves love Thanksgiving because they get the day off. Well, not the baking elves. Mrs. Claus and the baking elves have a lot to do to get ready for a Thanksgiving feast. The ovens burn hot in the kitchen cooking turkey, rolls and sweet potatoes. Thanksgiving dinner isn’t the only thing cooking. Thanksgiving pies are a big deal at the North Pole. 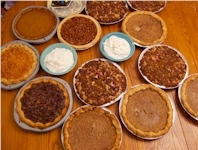 We have so many Thanksgiving pies, they are coming out our ears! Each baking elf makes a different pie. This year we have twenty-seven elves in the kitchen. Can you believe it? Twenty-seven different kinds of pie. That is something to be thankful about. Can you guess which kinds we will have? I hope you said pumpkin and apple and chocolate cream! There is so much to do, so this year I decided to help. Mrs. Claus gave me a recipe for pumpkin pie filling. I tried to follow the recipe, but I forgot to put on my glasses. I saw that the filling needed a spice with the first letter “C”. I looked in the spice cupboard and found one. “No, no, Santa,” said one of the baking elves. You want cinnamon spice not chili powder.” Ho ho ho. That was close! Do you know what chili powder tastes like? It is hot and spicy and not a yummy thing for pumpkin pie. Mrs. Claus gave me a new job of making the pie crust. I tried rolling the pie crust dough, but my beard got caught under the rolling pin. I rolled the crust until my chin bumped the counter. Mrs. Claus giggled at my Thanksgiving pie face. She gave me a new job of peeling potatoes. You can’t really mess up that job, right? That’s what I thought. Then my big belly knocked over the bowl. The potatoes rolled all over the floor. That’s when Mrs. Claus gave me a kiss on the cheek. “Ok Clumsy, I mean Santa, you better go outside and get some exercise. How about you play hoofball with the reindeer” she said. I thought that was a jolly idea. I’ll tell you more about Thanksgiving and the exciting game of hoofball later. Will you tell me what kind of Thanksgiving pies you like best? The baking elves want to know. I think eleven of them still don’t know what kind of pie to make. P.S. Do you like Thanksgiving pie? What kind of Thanksgiving pies do you like best? You can click here to tell me or, scroll down to see what other people are eating.. oops, I mean saying! 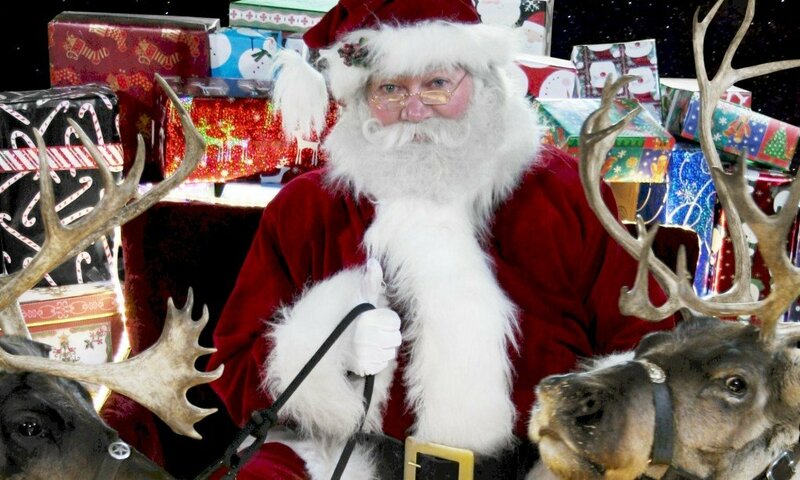 Dear Santa most of my family don’t believe Santa Clause but I do ! Well I hope your not late for Chrismas Eve because I’ve been waiting for you!!!!!! I like chocalate banana pie, apple pie, pumpkin pie,and cinnommon spice pie. I LOVE THEM SOOOOOOOO VERY MUCH!!!!!! Next PostNext Thanksgiving Day at the North Pole — now with hoofball!